Happy Sunday everyone! This week ends another month and brings us into the start of September. September will be starting off with Mercury still in retrograde. Once that turns direct on the 5th we have all of the planets out to Saturn direct and should start to see all areas of life moving forward. Today we are under the energies of the Scorpio Moon, with other soft planetary aspects that make today a pleasant and quiet one. Let’s see what the rest of this week has in store. Monday brings us a mid-morning Void of Course Moon that will then shift into optimistic Sagittarius by the later part of the evening. Sagittarius brings a sense of peace and stability. We tend to become a bit more orderly and calm, are ready to follow routines and rules and have a need for giving and receiving advice and recommendations. We may find a increase in our interests in social life and where we fit in. Tuesday and Wednesday are fairly quiet ones and best dealt with by not moving too fast or rushing things. Thursday is where things pick up again. As most of us are rising for the morning, the Moon will be Void of Course, and then moves into Capricorn as we begin the work day. In Capricorn our emotional charge seems to decrease as our feelings of duty and responsibility move to the fore. We tend to become more practical and logical, as well as more demanding and less sensitive to others and ourselves. Mercury, which is still in Retrograde, moves back into Leo. So try to get some playtime in before it goes direct on the 5th of September. Friday is a quiet one in the skies for us. On Saturday, we have a trine between Mars and Uranus. The transits of Mars to planets and points in the natal chart are relatively brief influences, lasting approximately 2-3 days. This is a very high energy time, although not necessarily predictable or reliable. Our energy tends to come in spurts or in response to situations that don’t normally affect us very much. We can use this energy to help propel us out of a rut over the next couple of days though. It’s also good for group activities, especially if you are taking on a leadership role. Its a time for focusing on the future and not the past. Sunday brings us a conjunction between Mercury and Mars, bringing a period of quick wit and strong mental impulses. Some may feel more productive under this transit’s influence. It’s a good time for putting our plans into action, or at least getting them ready for when Mercury goes direct in a couple of day. Happy Sunday all! We are once more nearing the end of another month. Today has a lot of active energy as we build up to Monday’s New Moon/Solar Eclipse. Our New Moon/Solar Eclipse can be seen in the USA at 14:30 on East Coast. Over here in the UK we will get a partial eclipse at around 19:30. A Solar Eclipse is a time of much deeper transformation than a regular New Moon. Both a New Moon and a Solar Eclipse will begin a period of change and unfolding. However, the energy released at a Solar Eclipse is active much longer than the one month following a regular New Moon. Let’s see what this particular New Moon, and the rest of the week has in store! Monday starts us off with a fun trine between the Sun and Uranus, so we could meet new, different and eclectic people today. Our New Moon/Solar Eclipse takes place at around 19:30 and takes place in the last degrees of Leo. The later degrees of a sign represent completions and endings, however a Solar Eclipse represents new beginnings. so look at where your passions and your heart are engaged compared to where you feel like you are just going through the motions. This is a New Moon that shouts “Celebrate yourself!” So you can tap into this powerful New Moon for dealing with issues around self confidence and acceptance of yourself. It’s about letting your inner light shine for all to see. Soon after the Solar Eclipse begins, the Moon will go Void of Course and then enter Virgo in the later evening hours. Tuesday sees the Sun joining the Moon in Virgo. Our focus shifts to the pieces of the puzzle–the little details of our lives. It is now time to take care of practical concerns. Tending to the details of everyday life may not sound like loads of fun, but it can certainly free us from unnecessary stress that results from “collecting” odds and ends of unfinished business. This is an ideal time to get organized, to do detail work, and to improve communications on the job. We also have a harmonious trine between Mars and Saturn, so it will help us get some productive things done today. While this transit can lend us some sustained physical energy, we do need to pace ourselves to avoid burnout if we want that endurance to last. The effects of this transit will only last us about 1 to 2 weeks, so make the most of it! Wednesday is a quiet day and we can still tap into that productive energy from Tuesday. The Moon will then go Void of Course in the later part of the evening. In the wee hours of Thursday the Moon enters Libra. The Moon in Libra creates this feeling of harmony and calm. We find we more easily connect to people, compromise is more likely and conflict less so. Its a time when we find it easier to understand and relate to others. We tend to be polite and diplomatic, and would rather avoid arguments. We also have a harmonious trine between Venus and Chiron, bringing a great opportunity for healing and rebalancing, especially in the areas of relationships, finance, resources and values. If you have been faced with persistent challenges and issues in these areas lately, you will find help from an influx of healing and helpful resources now. We do have a bit of a challenge here though, due to Venus making a square with Uranus, which can come to us as a conflict between balancing our freedom versus our sense of security. Under this transit we need to be careful of temptations like impulse buying and being a bit erratic with our resources. Friday sees Saturn ending its long retrograde cycle, which began at the start of April. This will help any stalled projects to get moving again in the coming weeks. Keep in mind that up to a week prior and a week after this time frame, Saturn’s energy feels more intense and stronger than usual. Some will experience this as feeling physically or mentally “heavy” or sluggish at times. The planet of love makes its move into the sign of Leo today as well, where love feels magnificent and grand. This is a warm-hearted, teasing, expressive, proud, and extravagant placement for Venus. This can be a very creative time, as Venus’ love of beauty combines with Leo’s creative flair for the dramatic. Find ways to feel good by making your surroundings and yourself beautiful and reflective of your inner spirit! Saturday starts us off with an early morning Void of Course Moon that will then move into Scorpio mid morning. This can be a time for healing as we destroy the roots of a disturbance in our life. We crave deeper conversation, and we want to get to the root of issues. Learning what makes people tick is something we can be really drawn to. But be careful that you don’t start pushing buttons or try to force others to confront their own demons. One thing to avoid though are manipulative tactics, brooding, and suspiciousness. We tend to be more drawn towards the darker side of ourselves too under this sign. Done wisely, we can get to the source of issues and create the seeds of new transformation to happen. We also have a conjunction between the Sun and Mercury today, where we are more inclined to have a lot to say. Messages of all kinds have a stronger impact under this aspect than usual. Sunday brings a sextile between Jupiter and Saturn. With Jupiter forming a sextile to Saturn, there are opportunities to put our plans into motion. We’re balanced in our approach to new endeavours, seeing both the potential benefits and pitfalls, and this improves our judgement. This influence helps to crystallize and lock down lessons learned and endeavours begun recently. Adding to this is a conjunction between Mars and the North Lunar Node, which are both in Leo now. For up to a week prior and a week after today we will probably feel more energized in some aspect. This is a transit where we feel more passionate, active, enthusiastic, somewhat wired and can also be angered easily. Or it may be that we find ourselves around other people who are this way. The way to get through this time is to find an outlet that is both beneficial and constructive, like trying new things or taking that leap of faith. Just make sure you balance this with a bit of common sense too. Happy Sunday everyone! We’ve hit that midway point of August already and hopefully, many of you are enjoying some much needed holiday time. Today is a good one for having those challenging conversations about our core needs and boundaries with a helpful trine going on between the Sun and Saturn. The start of our week will be focused on accomplishing goals with tangible results with the Moon currently in Taurus. Let’s see what the rest of the week has in store for us! Tuesday brings a Void of Course Moon in the early hours of the morning. This Void of Course is with us until the mid-afternoon when the Moon moves into Gemini. When the Moon is in Gemini we become active, feel stronger emotional sensitivity and a need for socializing. We also have the tendency to fall under influences that can lead to the danger of getting of course and making mistakes. We tend to buy things that we don’t really need, waste time with contacts that are futile, and visit unnecessary places and events. Emotions may become amplified but shallow. We may easily meet new people now, however half of the contacts we make will later turn out to be empty. Some of us will try to do everything all at once, which later leaves us stuck with unfinished projects and ideas. Wednesday brings us a conjunction between the Sun and the North Lunar Node. When the Sun dances with the North Lunar Node it is usually seen as a favourable energy where we are more likely to have important or prominent people coming into our lives. Financial matters tend to improve and positive discoveries are made. For a couple of days before and after this aspect we will notice that our sense of self purpose is much sharper and in better focus. We could come into contact with individuals who seem to understand us more or are on our “wave length”. We could also find that courage needed to let ourselves shine brightly. Transits are never without a challenging side though and with the Sun conjunct the North Node we are challenged to discover and fulfil our potential in a much broader context. Thursday brings a quiet morning in the skies, then the Moon moves into its Void of Course phase in the mid-afternoon for a brief period. It then shifts into Cancer. Under Cancer’s influence people become more sensitive and go deeper into their inner world, which takes on more importance at this time than the outer world. A feeling of belonging and safety is what motivates us under this influence. The Moon feels right at home in the sign of Cancer, as it rules the sign. This Moon position has much healing potential. Although insular by nature, our feelings run deep, making it an ideal time to get in touch with what motivates us. We want roots; we crave a sense of intimate connection that will. We also have a challenging square between Venus and Jupiter today, where we tend to want take pleasure in doing things in a very big way. But there is a need here to set boundaries or we could end up over spending and over doing it. By all means let yourself have some fun! But be wary of depleting your resources or wasting time on superficialities-leaving you hungry for something more substantive. Friday is another quiet one in the skies for us, but we are still under that nurturing Cancer moon, and Venus/Jupiter vibe, so spend the evening sharing a nice meal with a loved one. The Moon will be Void of Course briefly mid-afternoon on Saturday, before moving into Leo in the early evening. The Leo Moon wants us to do something creative or get out and play a bit. This will continue into Sunday as well. Sunday also brings us a sextile between Mars and Jupiter, where we find that our spirits are high, bringing the potential for cheerfulness, optimism and increase to our energy. We do, however need to go after what we want rather than expecting it to just fall into our laps. It’s a time for enjoying some healthy competition and we find that we feel stronger and are more straightforward than ever. Happy Sunday everyone! As we start our day off, the Moon will be in Aquarius and begins its build up to our partial lunar eclipse. Its a nice energy for sharing in social environments and looks like a pretty balanced day energy wise, so get out there and enjoy yourselves! Let’s see what the week ahead has in store for us! Monday is our Full Moon/Lunar Eclipse in Aquarius, which asks us to open up our minds to higher ideals and to not let ourselves get lost in the chaos of a world that can be emotionally reactive. A Lunar Eclipse is a powerful Full Moon that relates to endings. A lunar eclipse signals change in the emotional areas of our lives. And those who naturally fear change can become more tense prior to an eclipse. This is more so if they are dealing with big emotional issues in their lives. Tensions continue to build as the eclipse approaches until finally it is released with the darkening of the moon. Many can feel a sense of relaxed fulfilment, feeling soothed and calmer. As the Moon reappears there comes a sense of freedom along with a fresh perspective. Tuesday is fairly quiet for us, with a Void of Course Moon occurring in the late evening, and the Moon moving into Pisces before midnight. A Pisces Moon can bring about feelings of romance, heightened intuition, mystical and dreamy moods, and an interest in the unknown, religion and all that is magical. We tend to become softer, sentimental and more tender, speaking words of kindness and complimenting those we love. We also tend to have this deeper understanding of the hidden meaning of life, events and things, as well as more intimate perception of beauty, art, poetry and music. Wednesday is a quiet one in the skies with a gentle energy from the Pisces Moon. But Thursday makes up for this with a lot of activity. The Moon will be Void of Course in the early afternoon, bringing an introspective feel. We have a pleasant sextile between Mercury and Venus, which is good for sharing ideas over and easy going and un-rushed lunch or dinner. we benefit a lot from social connections today so make the most of these. We also have a sextile between the Sun and Jupiter, which brings further clarity and optimism to our plans and ideas. We may find it easier now to see the big picture and where we stand in it. Its a day for inspiration! Friday sees this gentler energy change as the Moon moves into hard charging Aries in the morning. Its a physical energy and many will feel restless, wanting to move around and be active. Some may actually feel this shift more than others. An Aries Moon tends to bring conflict more than most times, with emotional tensions growing, people becoming short-tempered and impulsive. Some may show a readiness and fearlessness to act in an extreme situation. Even the sweetest tempered person can become a bit mean under this moon. However, it becomes easier to shake old problem and the weight of tiresome responsibility. We want to free ourselves from everything that bothers us and makes our lives feel uneasy. Saturday brings us a happy energy with a trine between romantic Venus and fantasy loving Uranus, which can bring about a time of romance, creativity, and feeling a sense of oneness with the beauty of nature. This can be great socially and intimately because things tend to run more smoothly as well as adding a touch of magic to the pot. It’s important however to be very clear about what we truly want! This is also the day Mercury starts its retrograde cycle. Mercury is in Virgo now but will be shifting back into Leo at some point during its backwards trip. It beings a retreat and revise energy and what is really interesting is that this cycle will be ending in the same degree of Leo that our total solar eclipse will be in. Now the Virgo aspect of this cycle will help us with all of those fix it projects that we need to finish before the seasons change. However, Leo likes to play so we need to make time for this too. Sunday begins with a Void of Course Moon in the morning that will then move into Taurus just before Noon. When the Moon moves into Taurus, we feel the tension of the past few days start to drop away. People tend to become calmer and peaceful. We feel secure and stable. There is also this tendency for our thoughts and reactions to slow down, making us feel a bit slow in getting ourselves going. This is the best time for taking care of the home, running errands, restocking supplies and tending to routine maintenance. Its best to hold off on important business now,as well as signing of contracts or important papers, because we may make mistakes due to a slowed down reaction and thinking process. We also have a trine between the Sun and Saturn today. The Sun is energy and Saturn is discipline, and the Trine is the most supportive transit of them all. We’ll feel more up to the challenge of tackling projects that require real discipline and organization today. 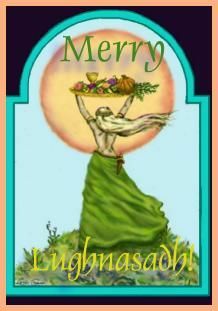 Blessed Lughnasadh everyone! The second half of the year is getting into full swing and I can’t believe how quickly it has all gone by so far! With this being a major time of year for going away, having the kids out of school, or having to pick up the slack at work while others are off, schedules can feel a bit out of balance as we re-adjust our routines to work around it all. Now is a good time to reflect on the seeds we planted earlier this year and see if these have bourn the fruit we have hoped. From there you can determine if changes need to be made or if you can harvest what has grown and use that to grow something new or stronger in the coming months. The special Lammas/Lughnasadh tarot reading is on offer in the Monthly Specials section this month along with a few other inspirational readings to help bring balance into your life. Many of you will be travelling now so I have a special reading just for you as well! There is also a Spiritual Journey and the Fool’s Journey readings for those who are looking to start off in a new direction. So be sure to stop by and have a look at the August Specials! You can have a browse through the many specialized readings I offer on the Tarot Readings page. Tarot’s Life Path & Personal Growth section is a good place to start! Or take a wander through the various Oracle readings on my site, like Rune, Angel, Faery and Animal Totem readings. All of these categories can be found on the main Reading Room page. Don’t forget to check out the other areas on the Readings page, like the Oracles, Rune andAnimal Medicine Cards sections. Congratulations to you both! I’ll be sending you two an email to tell you how to claim your prize shortly! For those who haven’t entered the raffle yet, each month I select 2 random people from entries submitted to win a reading of your choice worth up to £15.00 from any area of my site. For more details, and to enter August’s raffle, stop by and visit the Raffle Entry page! Good luck!